Last week the Herbst Junction turn was returning to Salvation Point after working the Red Earth Co-op and the Salvation Point industries. 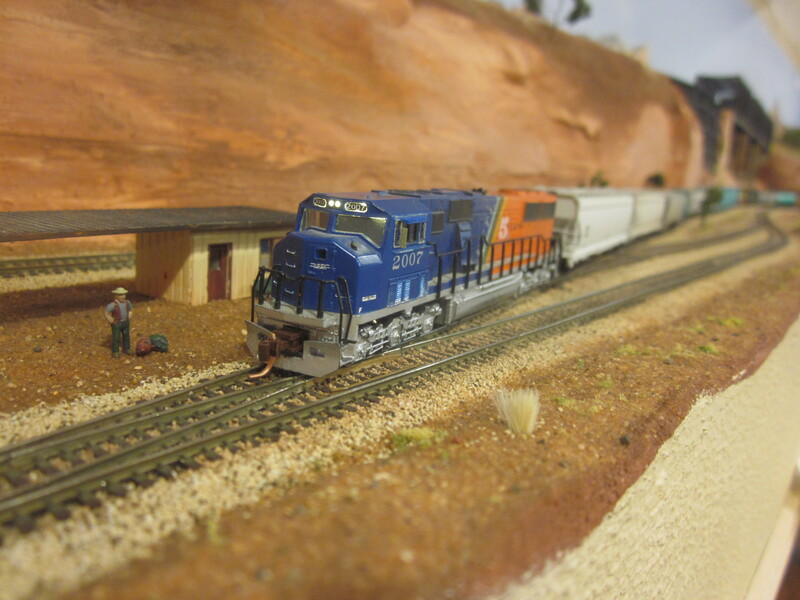 This week the operating session comes to a close with runs to Globe and Gallup, and the Phoenix-Salvation Point-Durango train passes through to clean everything up for next time. 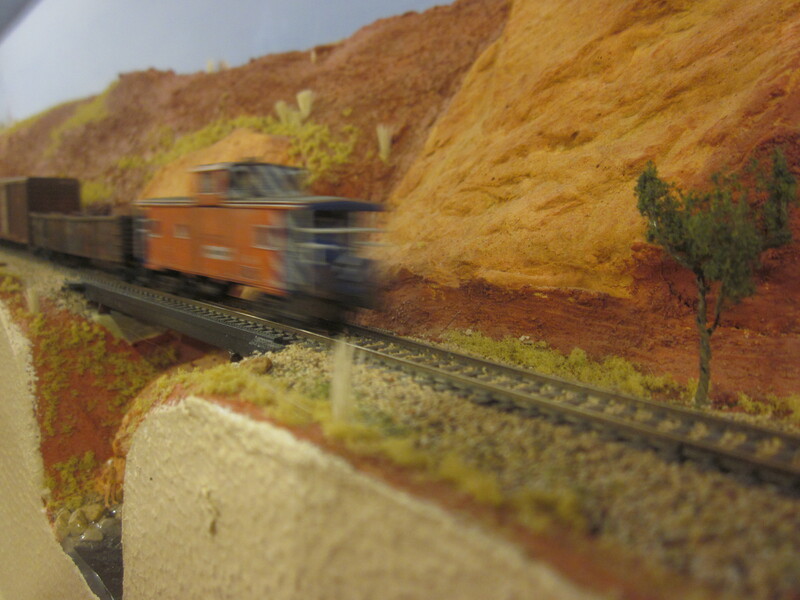 Globe is not modeled on the layout, but is merely a destination in Southwest Staging. 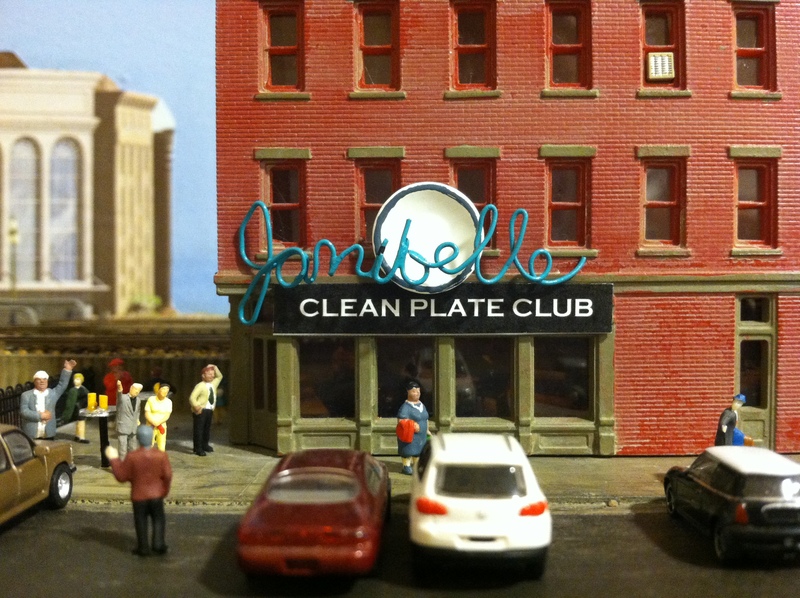 It’s a simple out-and-back operation, with a little work to do at Herbst Junction. 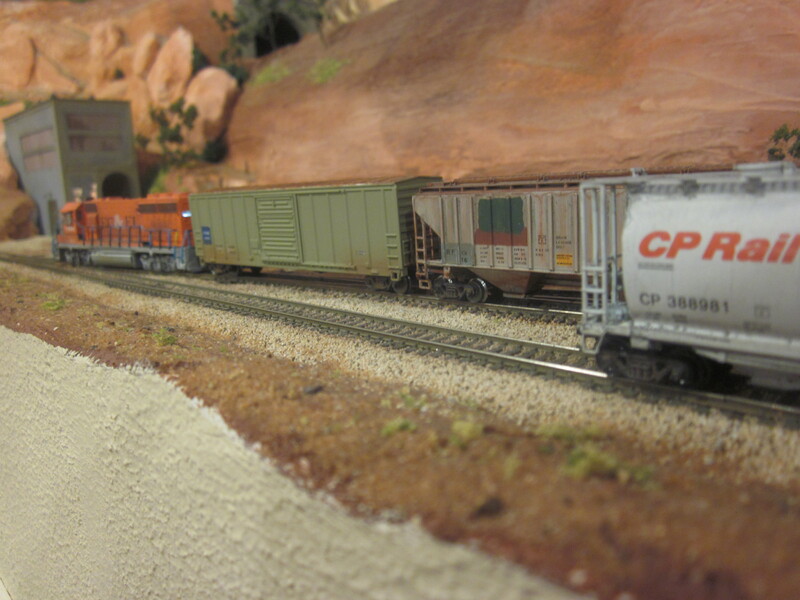 The crew of train SPG31 heads west from Salvation Point Yard and descends into the Benjamin-Henry Canyon. Arriving at Herbst Junction, the crew picks up any Globe-bound loads spotted there by the Herbst Junction turn. With everything coupled up once again, the crew selects the diverging route toward Globe and gets underway. 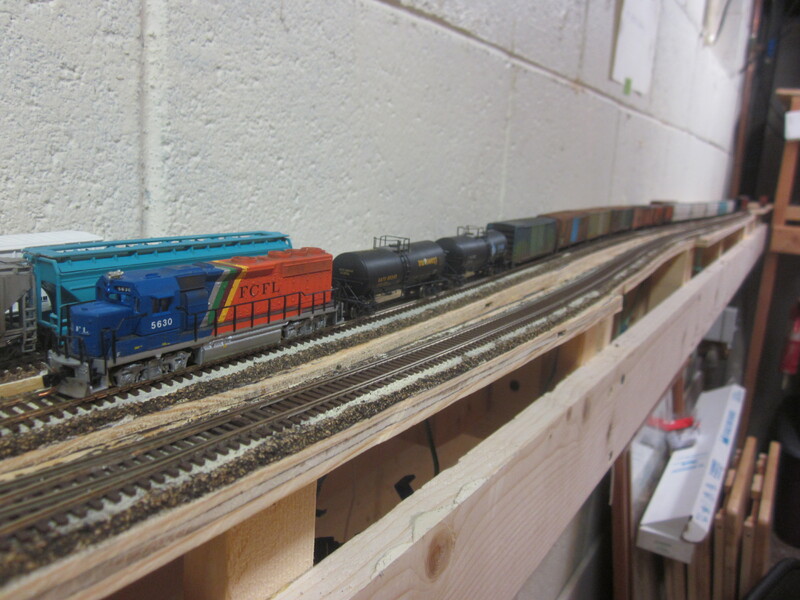 In staging, the inbound loads are cut off and the locomotive is backed up to the outbound train we placed during setup. SPG31 crosses back to the main at Herbst Junction and highballs back to Salvation Point. The Gallup turn is the only eastbound local. SPL41 rumbles out of Salvation Point Yard and up the hill toward Many Lost Ways National Park. 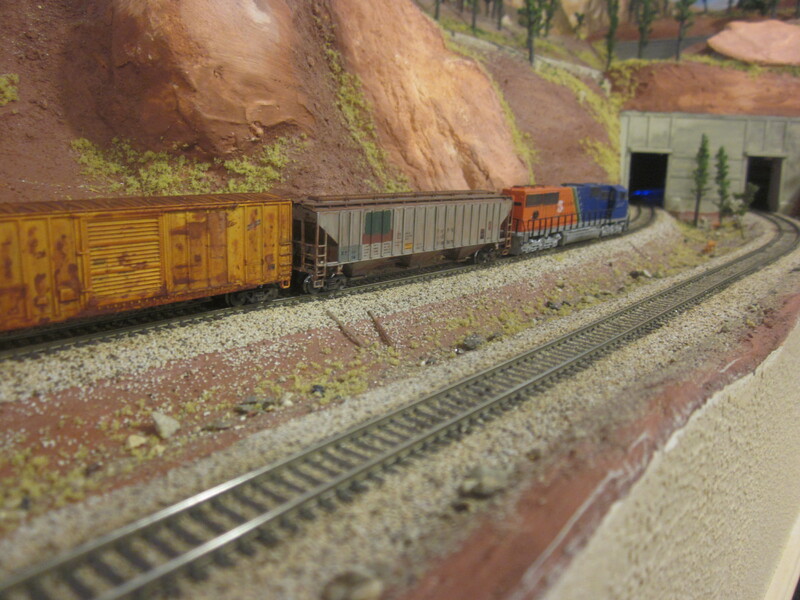 At Northeast Staging, the train pulls to a stop just short of the outbound Gallup loads we spotted during setup. 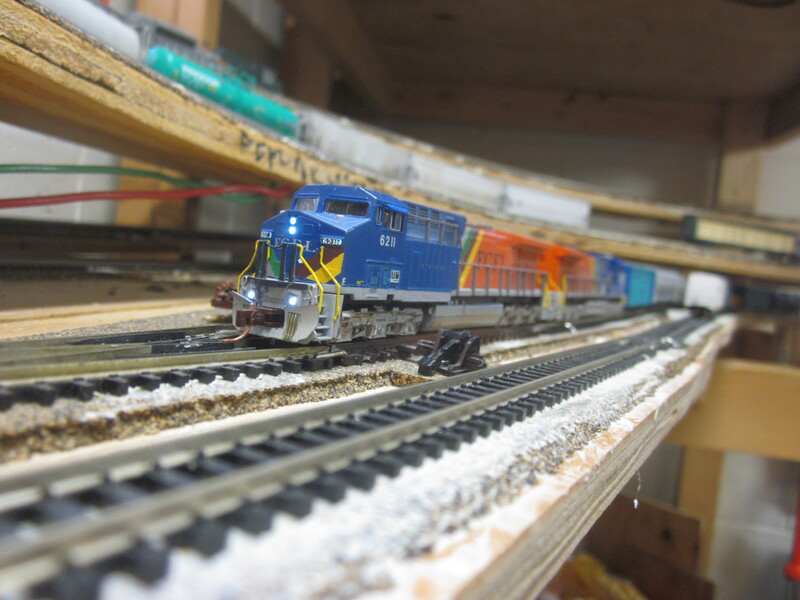 The staging yard is a fiddle yard, so the locomotive is simply picked up and turned around, then coupled to the outbound train. The inbound cars are manually removed from the track. 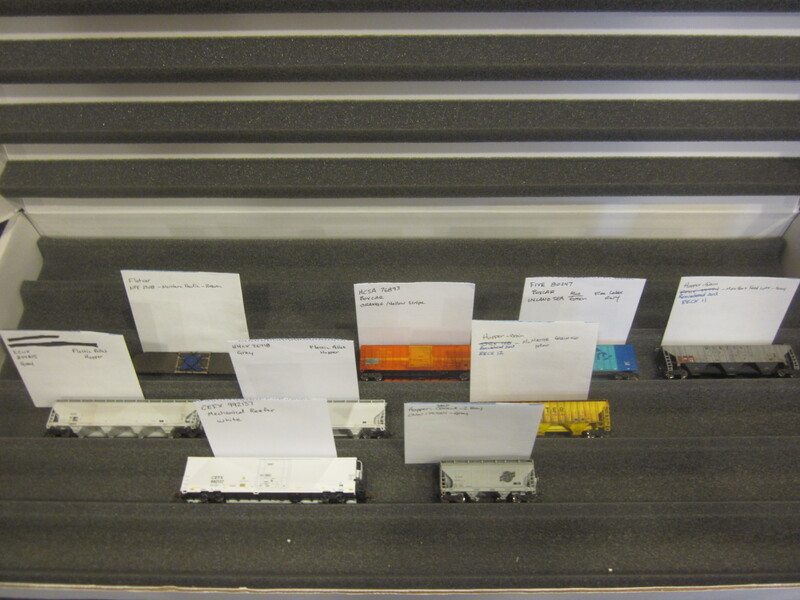 Their assignment cards are turned to the next destination, and they are staged as the outbound train for the next operating session. Train SPL41 then rolls back to Salvation Point. While the Gallup crew is heading out of Northeast Staging, the last train of the day is getting underway in Southwest Staging. PSPD12 was also staged at setup, with freight for Durango up front and loads to be handed by the Salvation Point locals in the next session out back. The long freight heads across the Benjamin-Henry River enroute to Salvation Point. 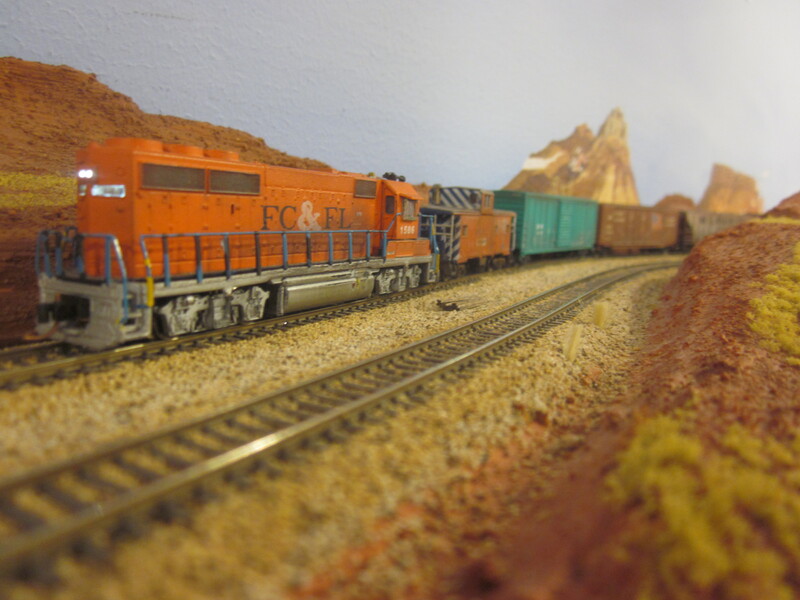 The Salvation Point yard crew has set out all of the outbound Durango freight. 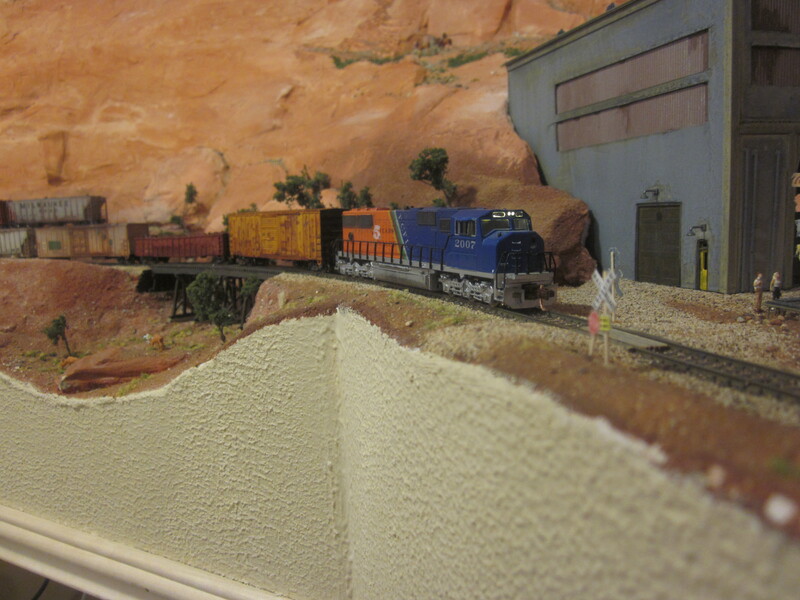 When PSPD12 arrives in Salvation Point, the crew pulls the locomotives and the cars continuing to Durango forward, then backs onto the siding where the outbound Durango work awaits. When that’s hooked up, the train regains the mainline and powers up the hill to Northeast Staging. Its arrival there marks the end of another long day on the FCFL’s Four Corners Division. The layout is nearly ready for more formal operating sessions with more operators. I need to work out the timing to allow the trains to run on a schedule rather than just sequentially. I will also include in the schedule Amtrak’s Badger State, the steam tourist shuttle, and a Union Pacific coal drag that runs on trackage rights over the FCFL. This will add an extra challenge as crews will have to wait for clear track and give way to priority trains. 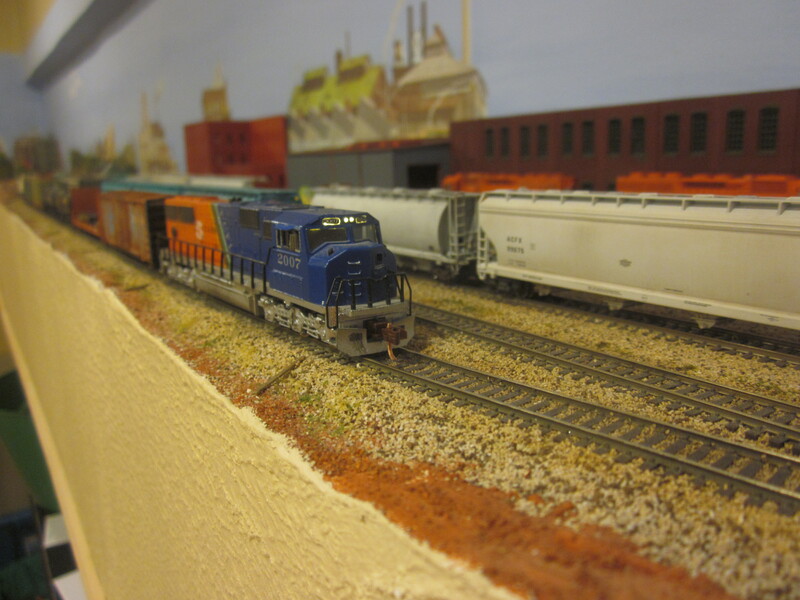 Adding even a low-key operating system like mine adds to the fun of any model railroad! 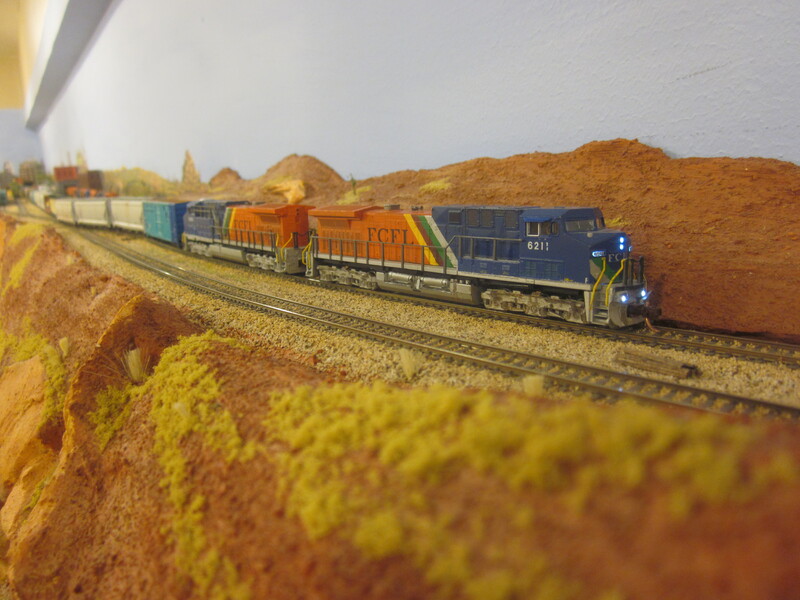 When we left off last week, the Flagstaff local had just arrived in Salvation Point, and the yard crew was sorting out the freight. Now the yard crew has assembled another challenging local job, Train SPH21, which switches the local industries in Salvation Point as well as Red Earth Co-op in Herbst Junction. 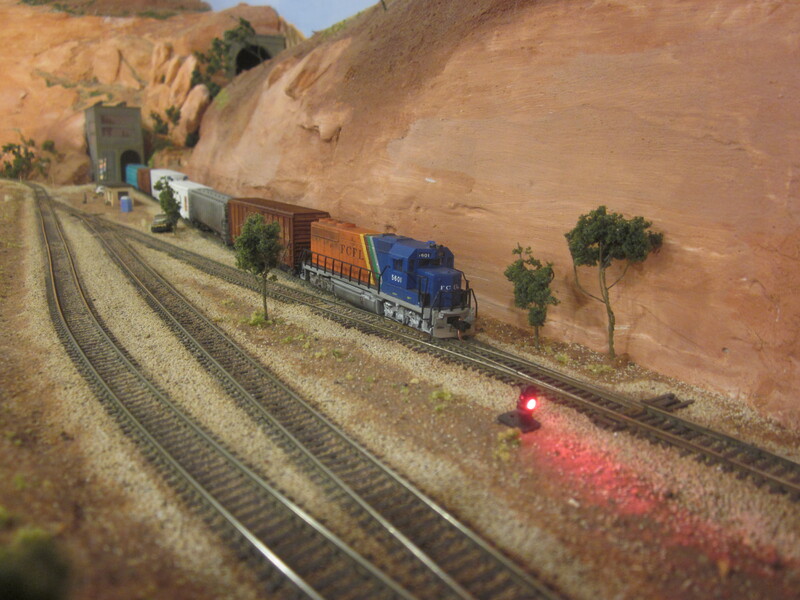 The Red Earth Co-op siding faces west, so a locomotive pulling cars from Salvation Point would need to perform a runaround maneuver to pick up and spot cars. 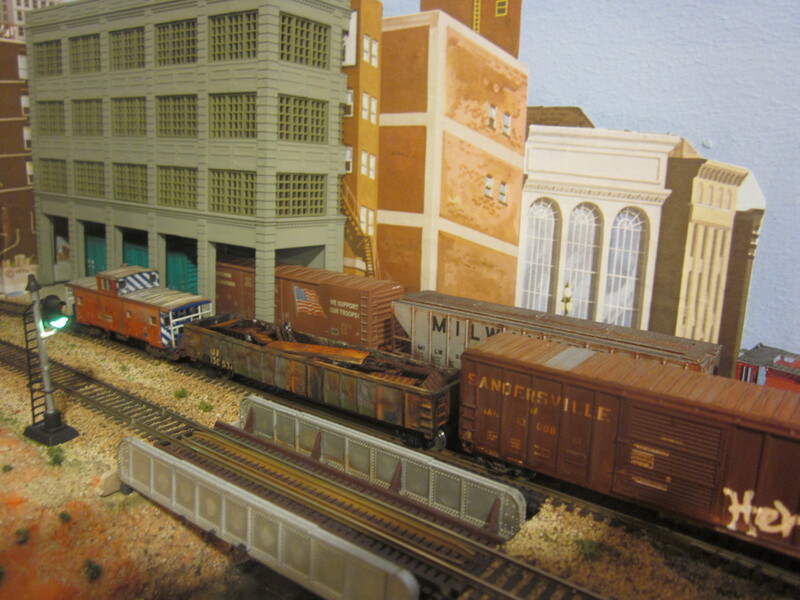 The passing siding at Herbst Junction can accommodate no more than three cars, so to work the co-op the train has to be pushed from Salvation Point. This is a long push move on the main line, so a caboose is employed to protect the train. 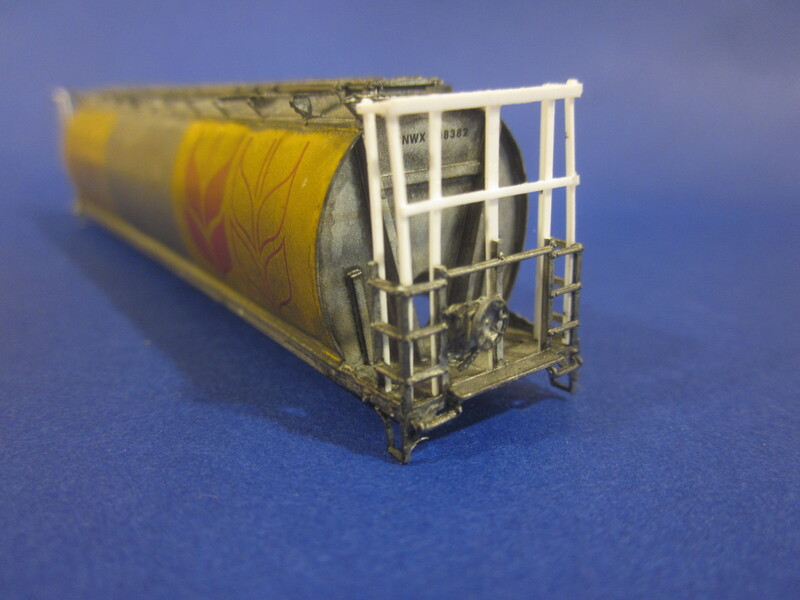 It’s not really necessary, but I like a caboose now and then and it adds a little complexity to the work. There are two industries in Salvation Point. Paul Power’s spur faces east while Midtown Construction Materials faces west. The train is blocked with the Paul Power work on the west end and Midtown’s cars to the east. The crew runs the locomotive around on the passing siding and couples on to the caboose, shoves the train up to Midtown and switches the inbounds and outbounds. The locomotive is run around to the east end of the train again at the passing siding, and backed down to Paul Power to work the traffic there. 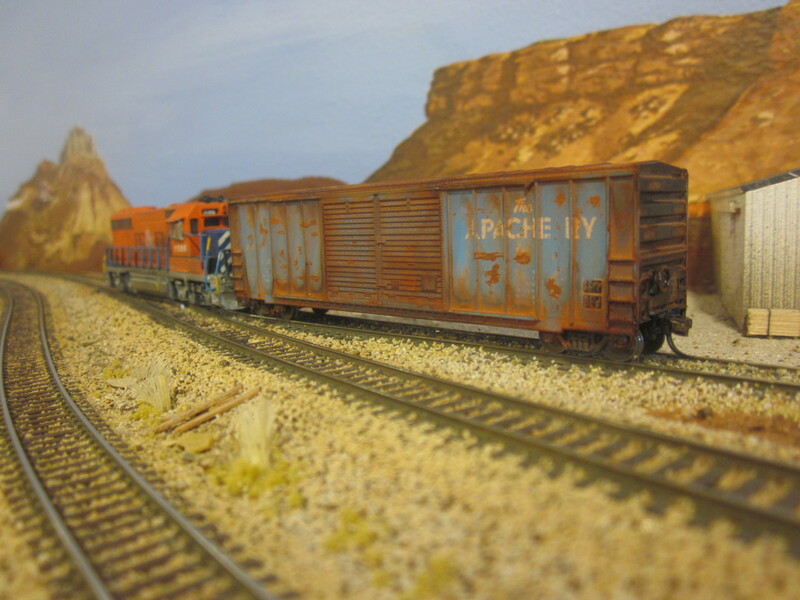 The train is reassembled and the caboose leads the way down into the Benjamin Henry Canyon. 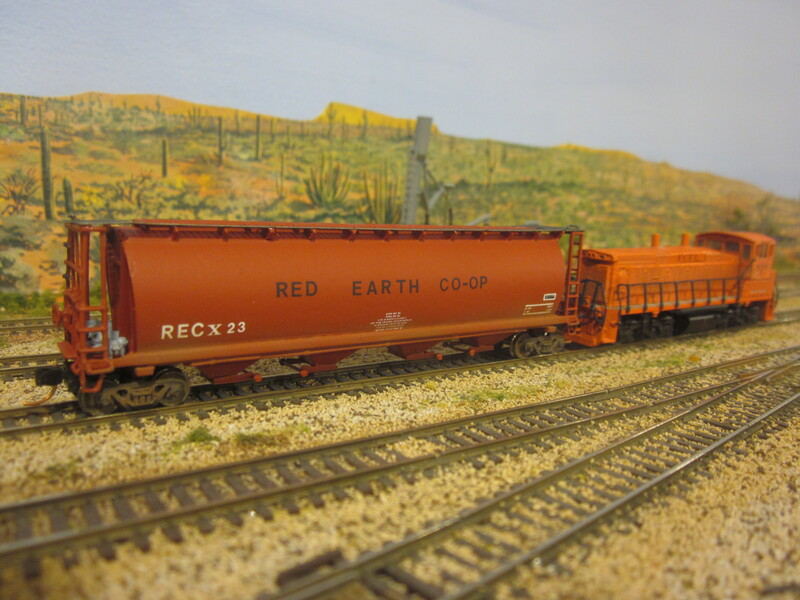 At Herbst Junction, the crew works the Red Earth Co-op spur. 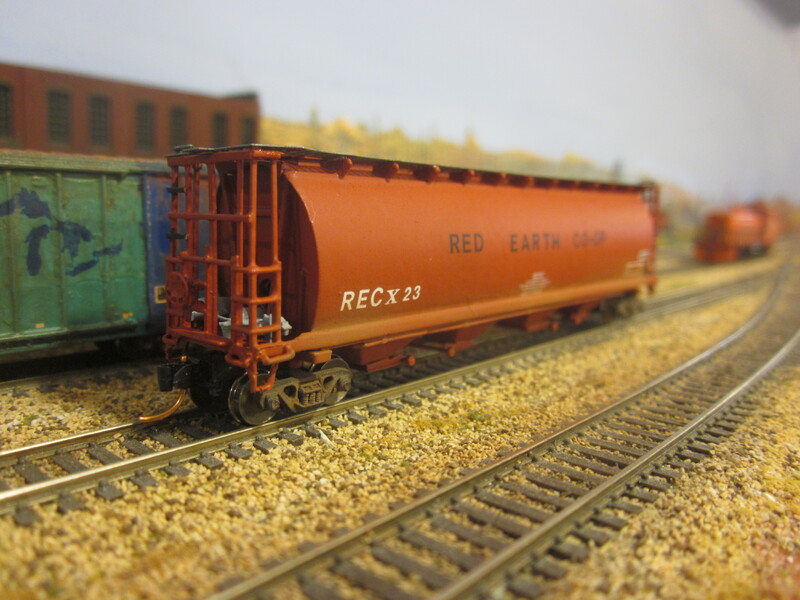 Any loads bound for Globe are spotted on the short siding by the depot. 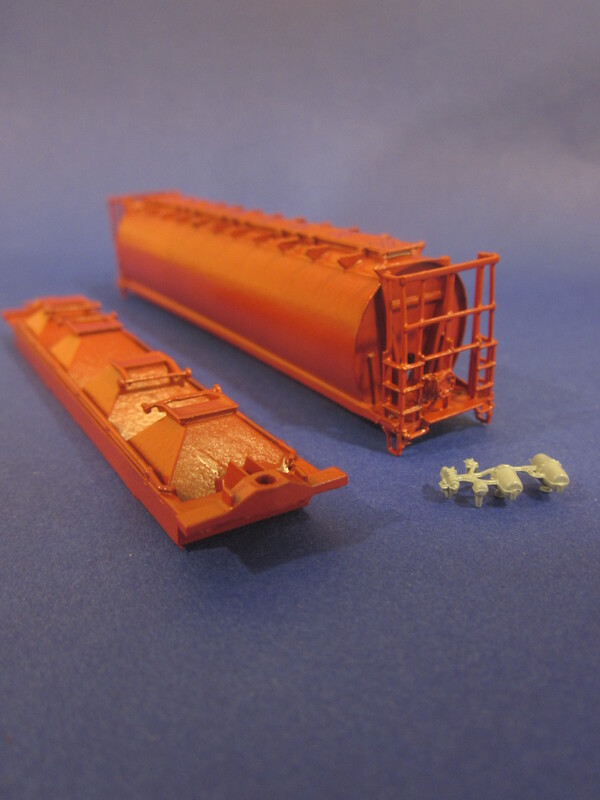 This Red Earth Co-op hopper (with patches) is bound for Globe. Rather than haul it to Salvation Point, it is spotted in Herbst Junction for the Globe Local to grab later. The train is reassembled and the crew returns to Salvation Point in time for lunch. Next week: The Globe and Gallup locals, and the end of a long day on the job. 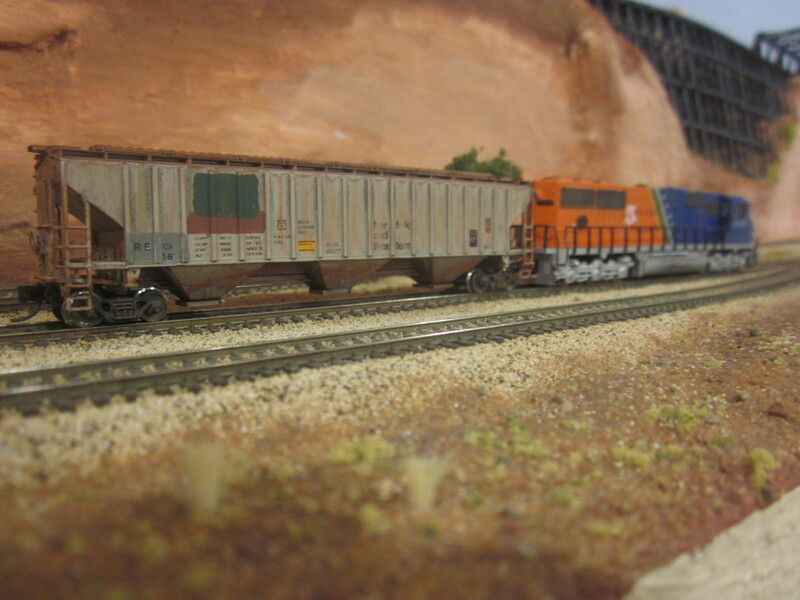 Last week train DSPP10 dropped a string of cars at Salvation Point on its way to Phoenix (AKA Southwest Staging). 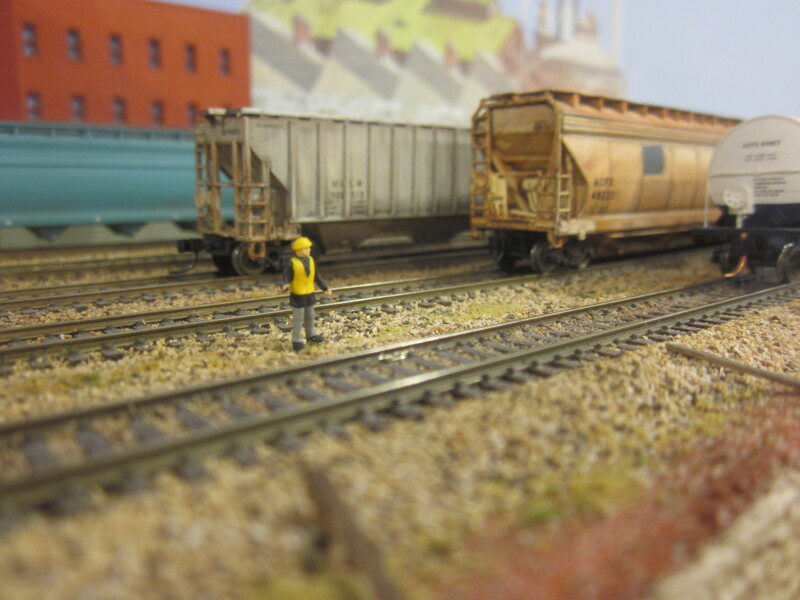 This week the Salvation Point yard crew gets to work sorting those cars and building the “local” trains that will deliver them to cities and industries across the layout. 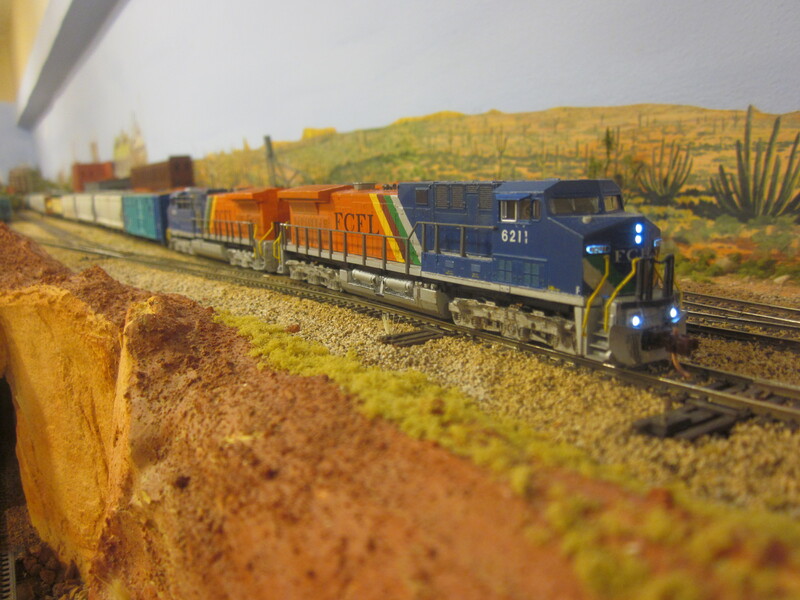 The busiest locomotive in the fleet is the MP1500DC switcher assigned to Salvation Point Yard. The yard crew cuts apart the string of cars left behind by the Phoenix-bound DSPP10, and sorts them by destination: Flagstaff, Salvation Point industries, Herbst Junction, Gallup, Globe. The crew then builds the local trains that will work those destinations. The first local on the schedule is the Flagstaff turn, Train SPF11. Flagstaff presents some challenging switching, with industrial spurs facing east and west. Just getting to Flagstaff from Salvation Point requires the train to reverse direction. To help the crew manage it all efficiently, SPF11 is built with a locomotive at each end. Here is where Digital Command Control (DCC) is essential. 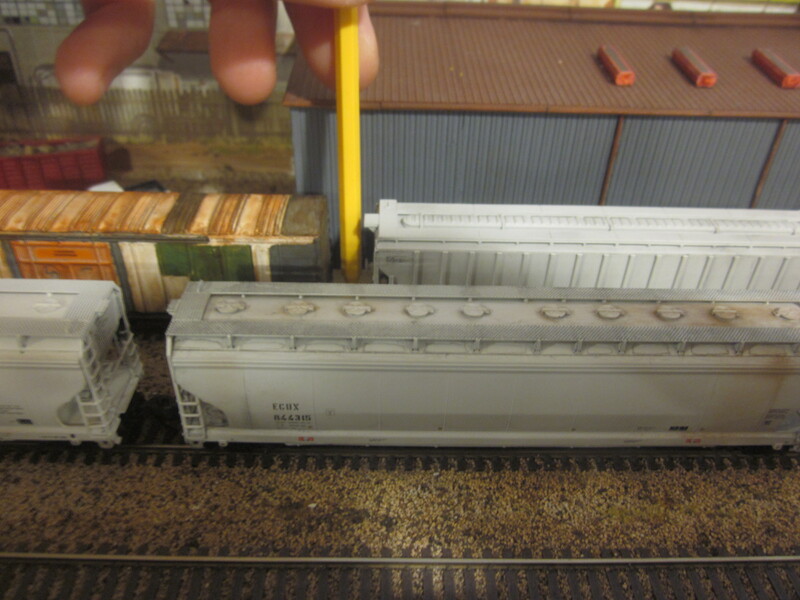 Engine 5601 (DCC address 56) and 5630 (address 30) are set up for multiple unit operation. 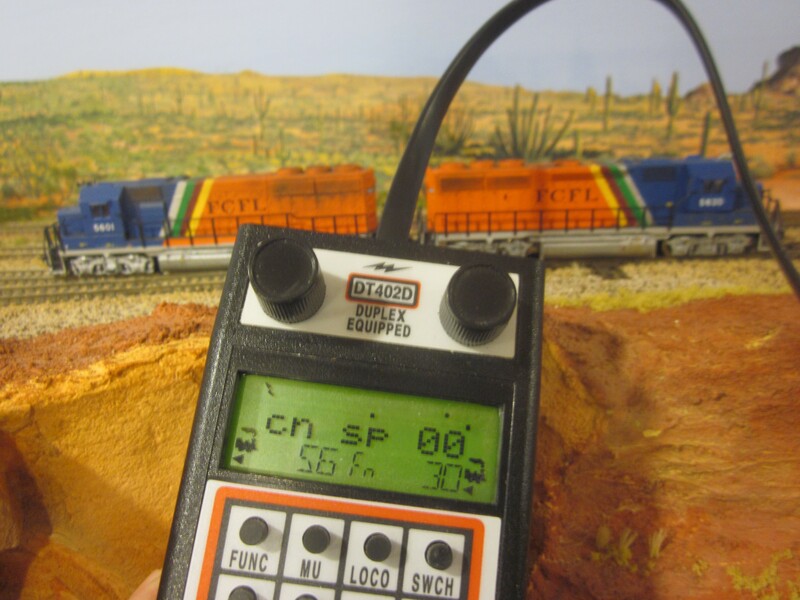 While in a “consist” like this, both units respond to the same throttle commands. The consist is broken, allowing the engines to operate independently. 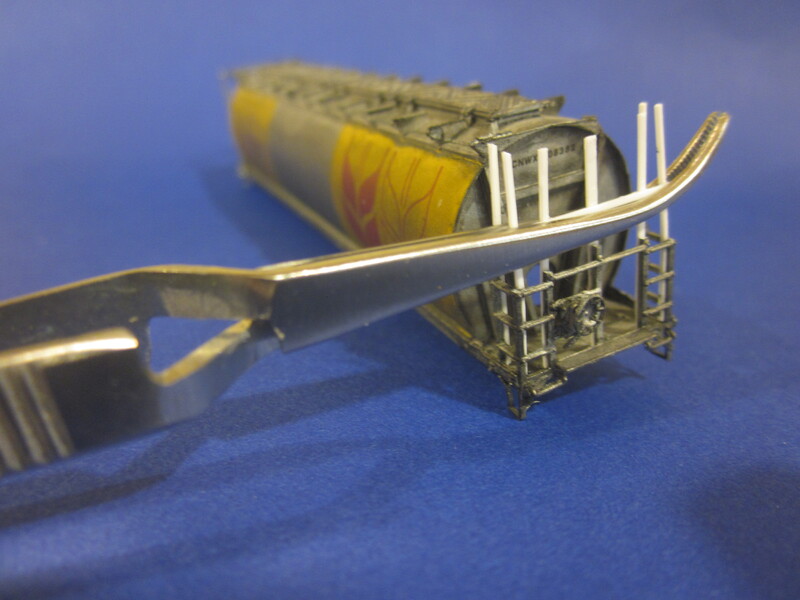 The locomotives are cut apart, and one is sent down the line to be on the head end of the train. 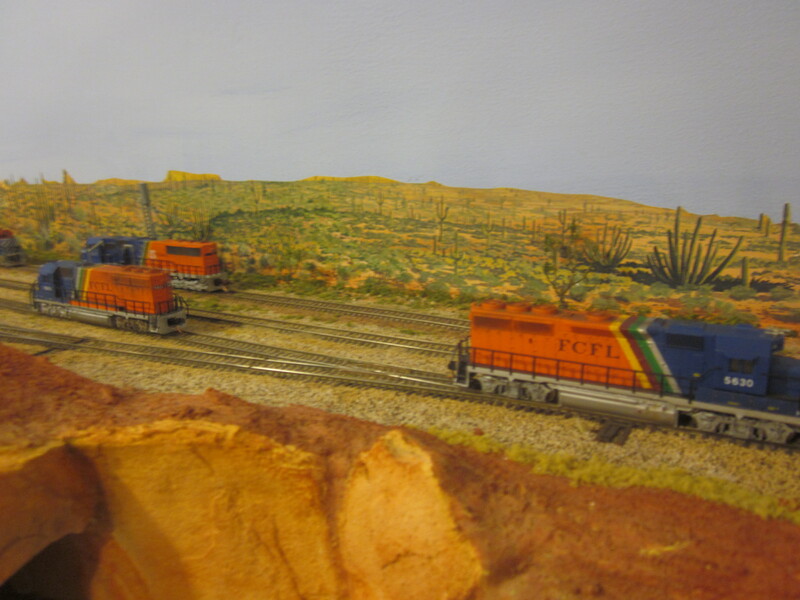 The other locomotive pulls the Flagstaff cars from the yard and shoves them up to couple with the first locomotive. The consist is re-established and the train is ready to roll. 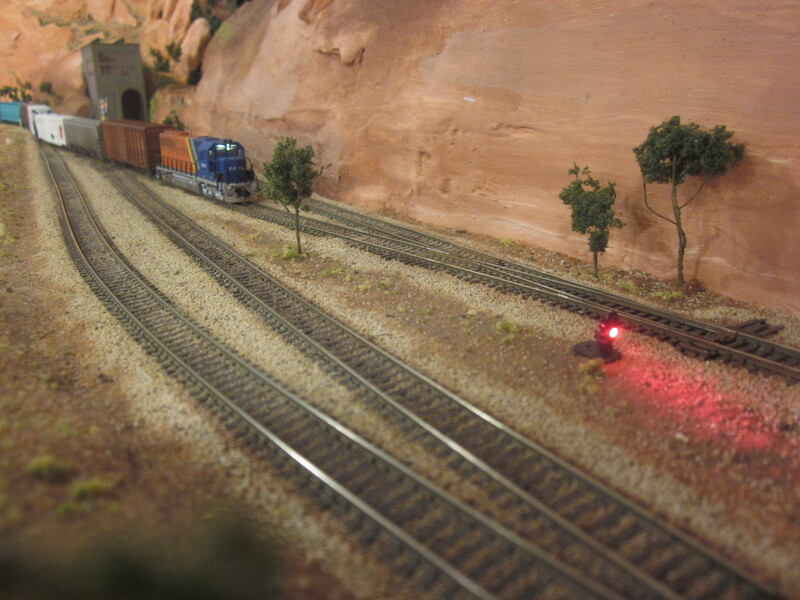 The train heads east, downhill into the Benjamin-Henry Canyon and pulls up short of the crossover at Herbst Junction. 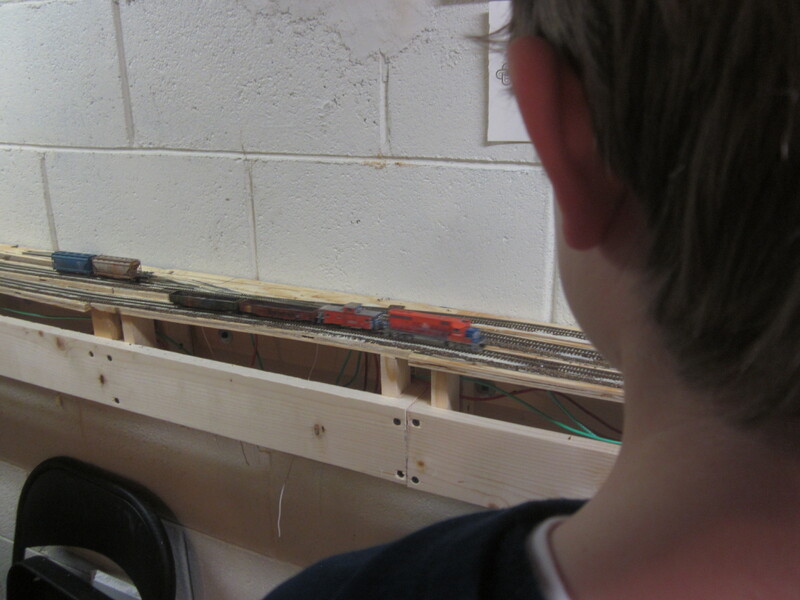 The crew selects the diverging route and pulls clear of the turnout on the branch line. Taking up residence in the locomotive now facing west, the crew throttles up and heads through The Cell into the longest tunnel on the FCFL. Arriving in Flagstaff, the locomotive consist is broken again. 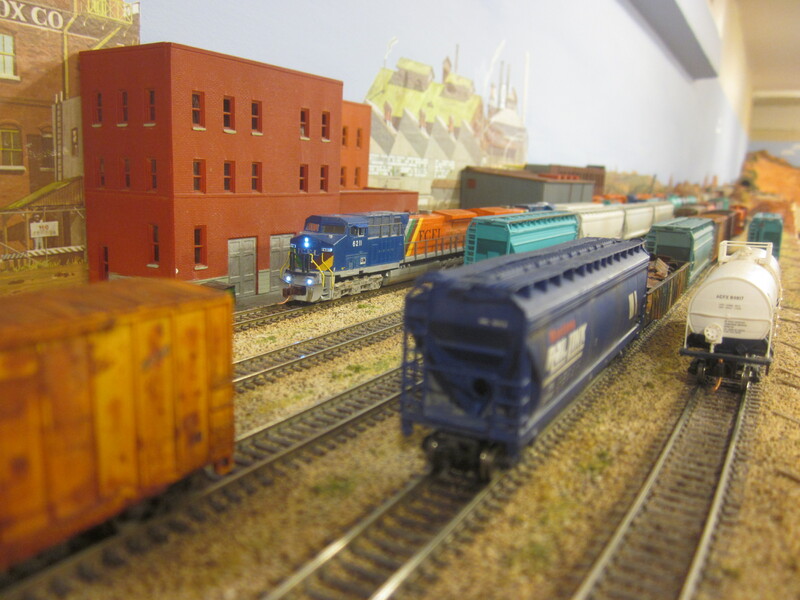 One engine switches the industries with east-facing sidings, the other works the west-facing sidings. With the inbound cars all spotted and the outbound cars all pulled, the train is assembled with a locomotive on each end for the trip home. The reverse move at Herbst Junction is repeated, and the train finally arrives back in Salvation Point. Next Week: We work the local industries in Salvation Point and make a run to Herbst Junction. 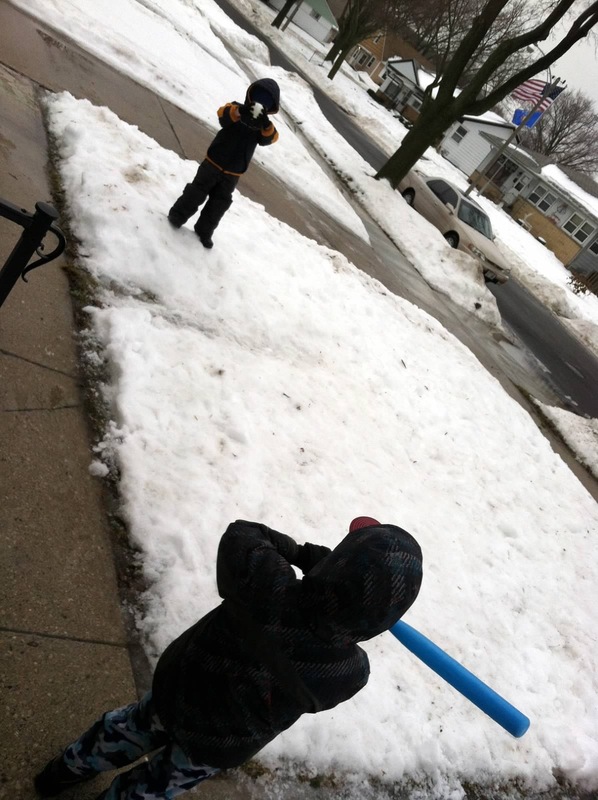 Last week I introduced my laid-back operating scheme for the FCFL. 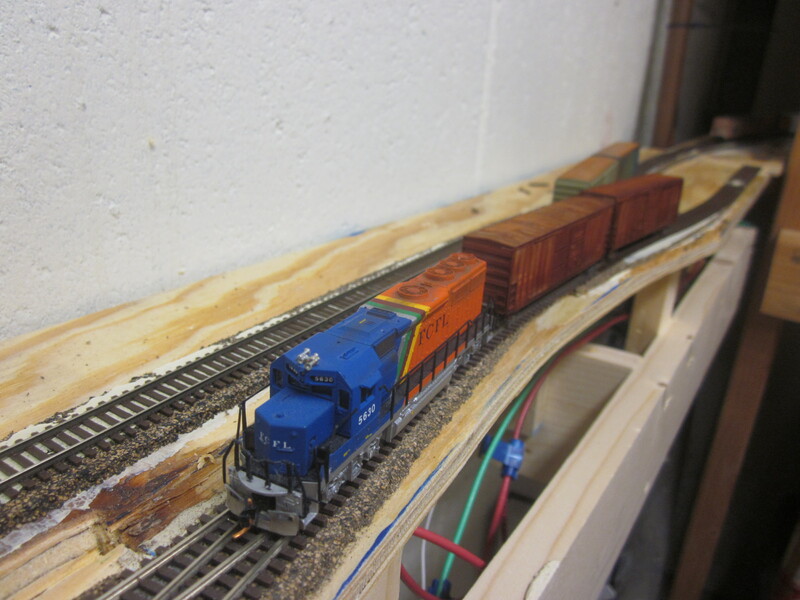 This week I’ll describe the setup for an operating session and run the first train of the day. It’s helpful to think of the layout as a theatrical stage. The “scenicked” portions are where the drama plays out, while the staging yards are the wings. There are rules for the stage and rules for the wings. 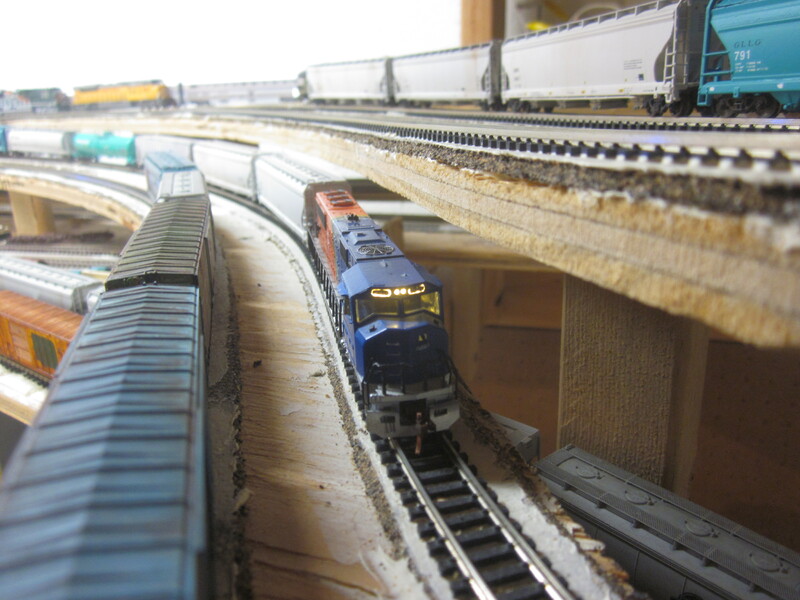 On stage, cars can only move by locomotive power. Nothing gets picked up. 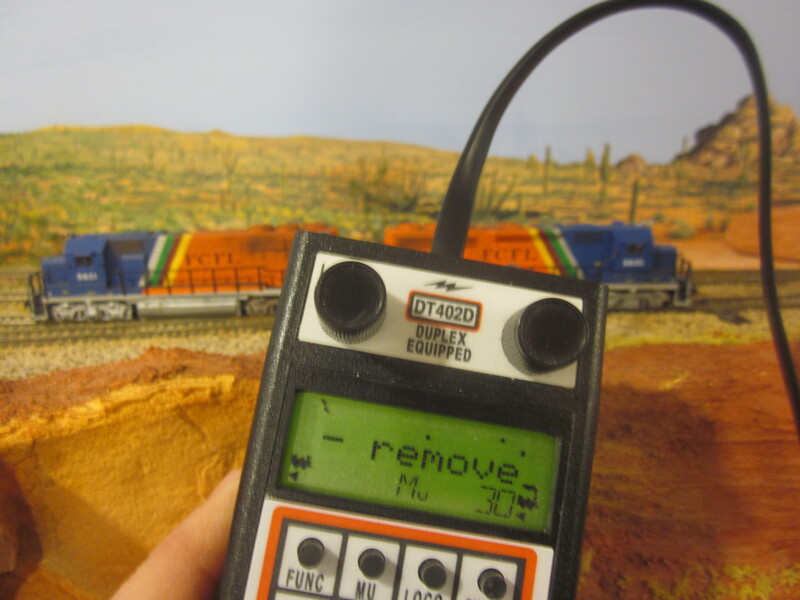 The only manipulation allowed is a little help coupling or uncoupling, and a gentle nudge if a locomotive looses electrical pickup. The staging yards are “fiddle” yards where none of those rules apply. 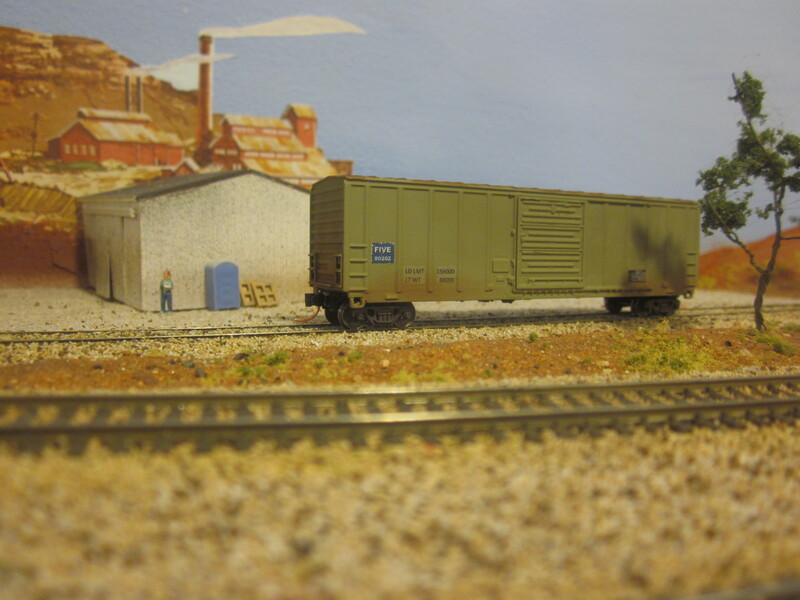 Operators are free to pick up and move engines and cars, and rolling stock is moved by hand between storage boxes and the layout. 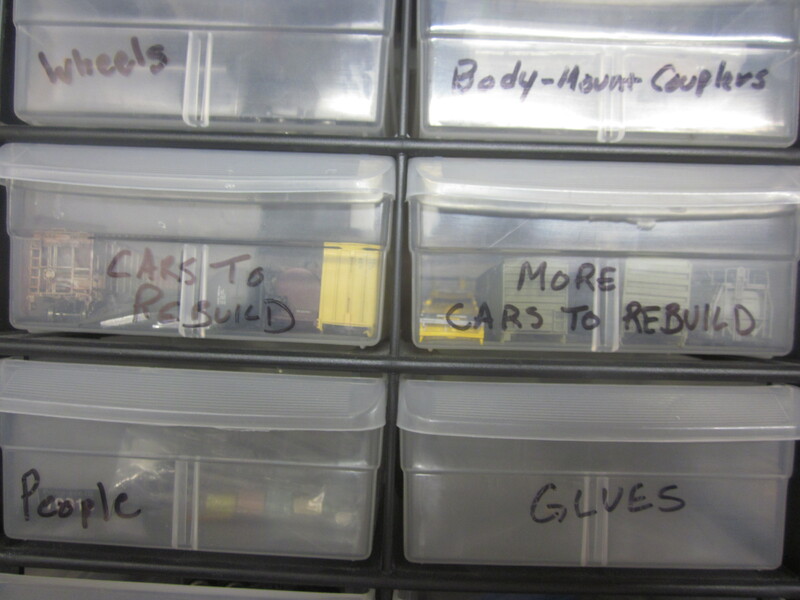 Setup starts in the storage boxes, where I select cars to place at industries around the layout, and to include in the trains that start in staging. 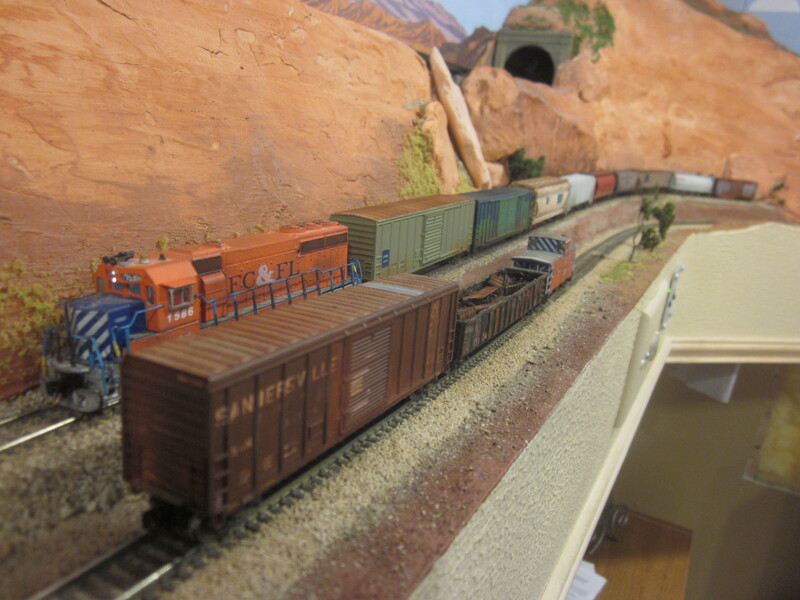 In addition to placing cars at industries, I assemble trains in staging for Globe, Gallup and Phoenix. 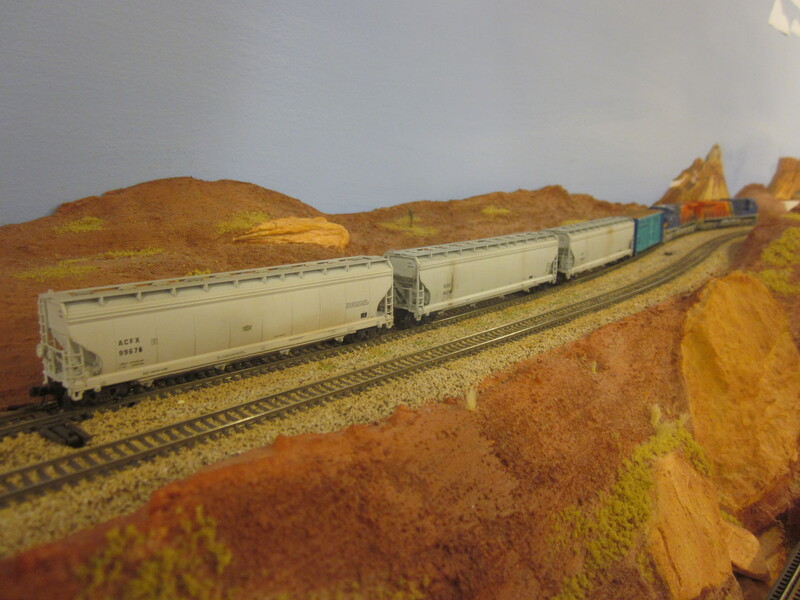 Later we will run local trains from Salvation Point to Globe and Gallup, and these trains placed in staging at setup will be hauled back to Salvation Point. Each car’s envelope is stuffed with an assigment card, as discussed in the last post. Each industry has a nail driven into the benchwork beneath it. 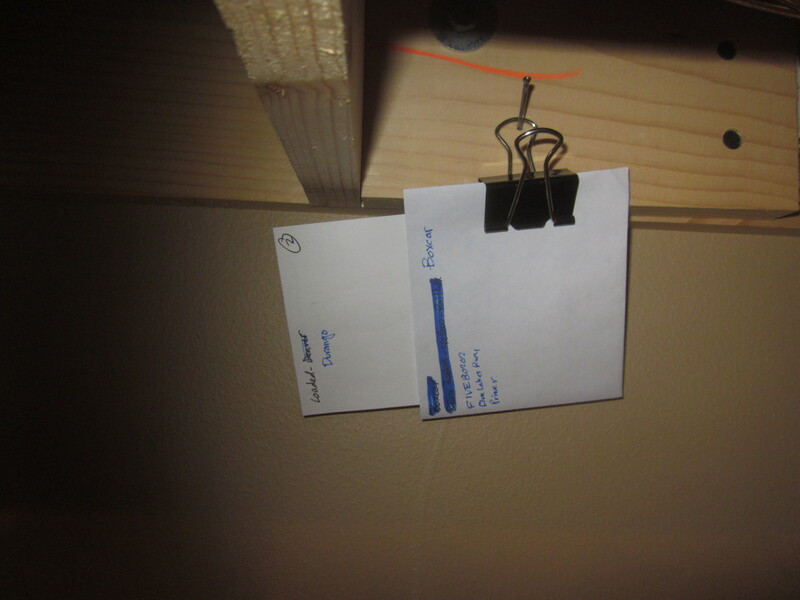 Binder clips holding the envelopes for the cars spotted there are hung from the nail. 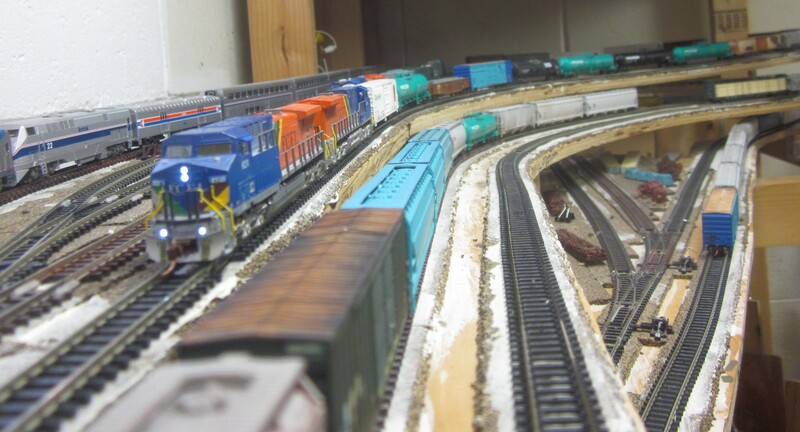 Once the layout is staged in this manner, each successive operating session requires minimal setup. Train DSPP10 ready to go in Northeast Staging. 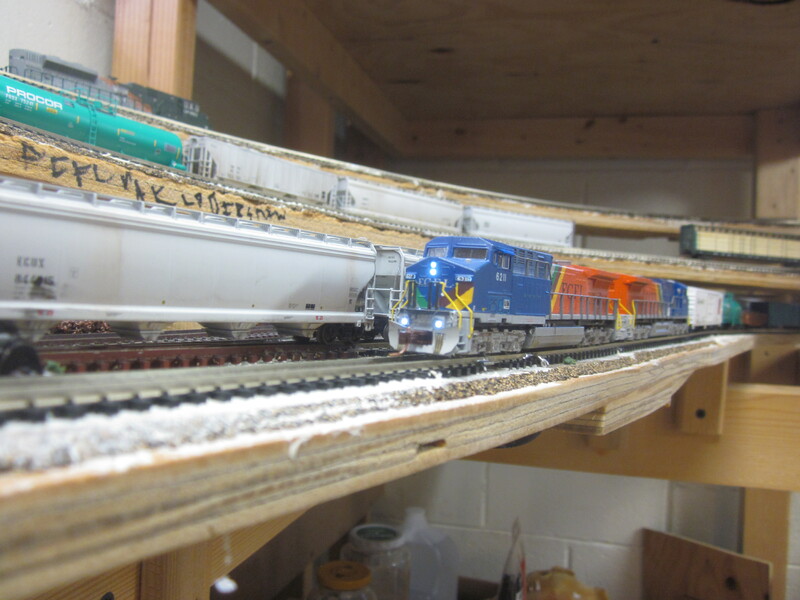 This “unscenicked” area of the layout is like the wings of a theater, where the actors and props are staged for action. 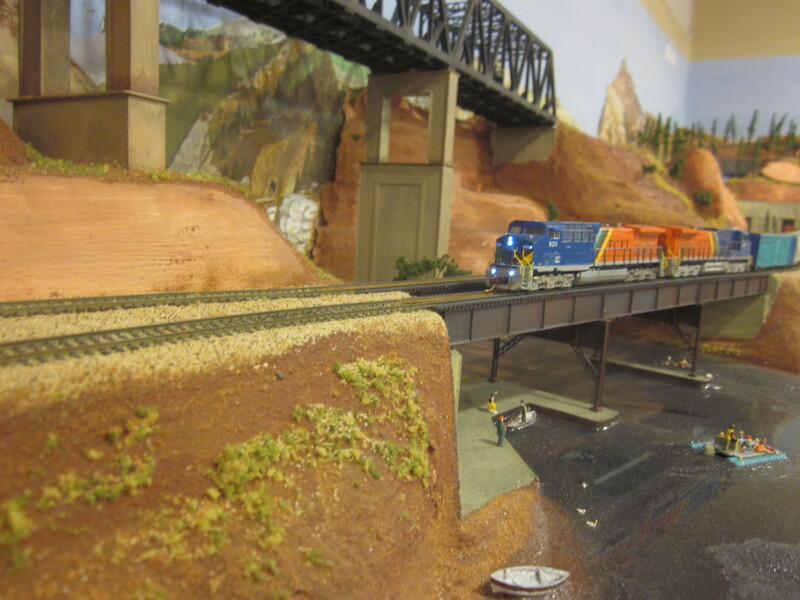 Also visible in this picture are trains staged at Globe, Gallup and Phoenix. 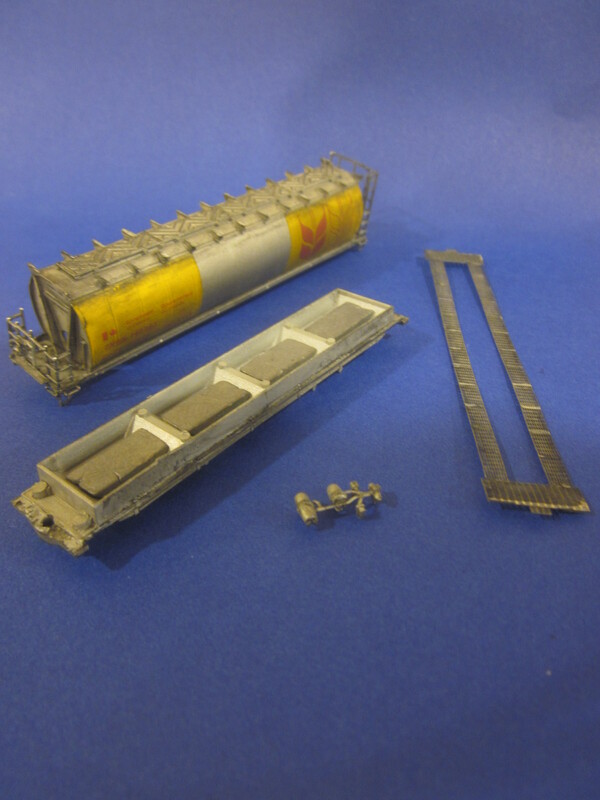 DSSP10 is one of the trains assembled by hand in staging. 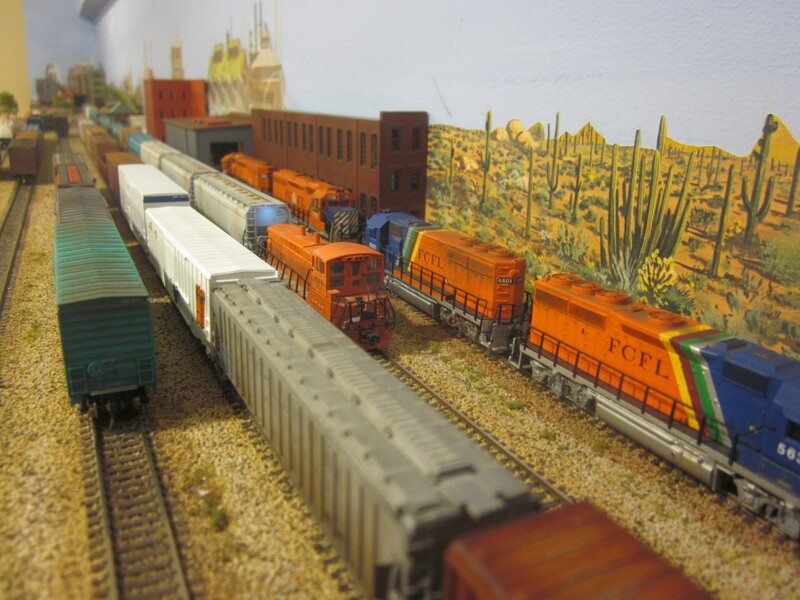 I use a technique employed by real railroads called “blocking.” Cars heading toward similar destinations are grouped together in the train. 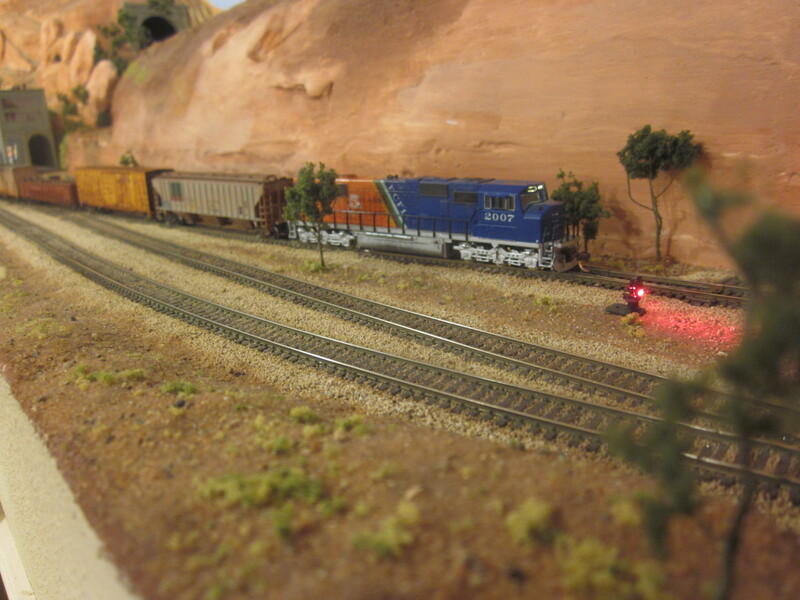 For the Durango – Salvation Point – Phoenix train, I place the cars bound for Phoenix up front just behind the locomotives, and everything else follows. 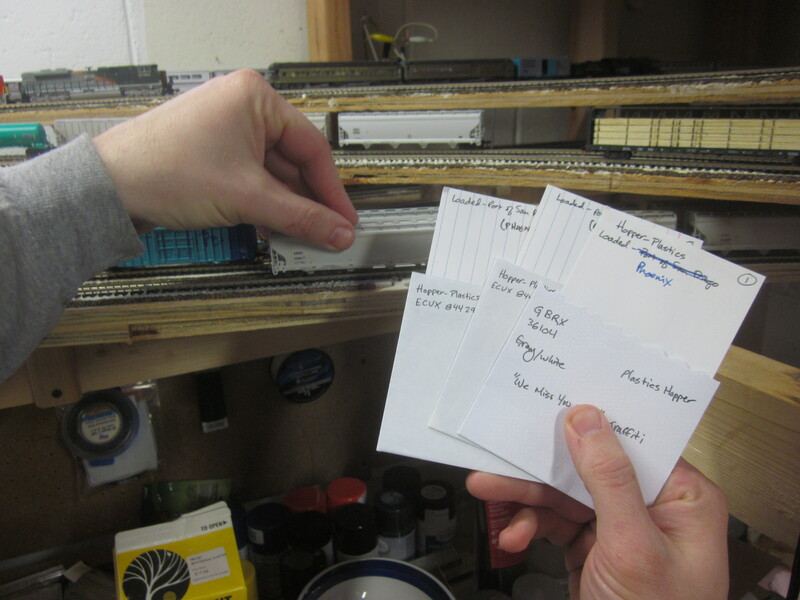 The envelopes for the cars on the train are stacked on a clipboard for the crew to carry. The train departs staging, crosses the Benjamin-Henry River and briefly passes through Many Lost Ways National Park before descending into Salvation Point. Train DSPP10 arrives in Salvation Point. When DSPP10 arrives in Salvation Point, all the cars not continuing on to Phoenix are cut off. The yard crew uses the yard goat, a MP1500DC, to pull the local traffic clear and shunt it into the yard. Any cars in Salvation Point bound for Phoenix are then coupled to the end of DSPP10. Then it’s a straight shot through the canyon, past Herbst Junction and into Southwest Staging. 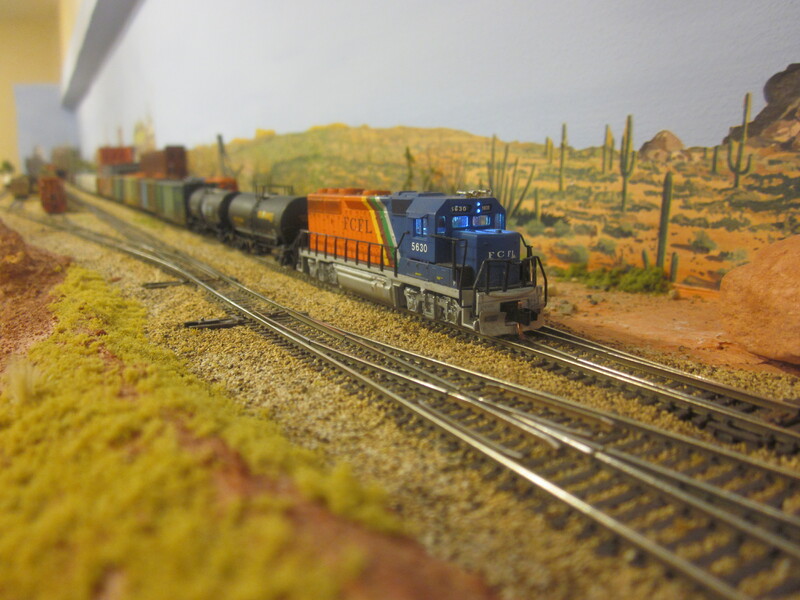 When DSPP10 arrives in staging, the locomotives are cut off and coupled to train PSPD12, the Phoenix – Salvation Point – Durango train that will be the last “run” of the day. These cars were staged here during setup. The assignment cards on the arriving train are all turned to their next destination. The cars are manually re-blocked according to their new assignments, thus creating the Phoenix – Salvation Point – Durango train for the next session. 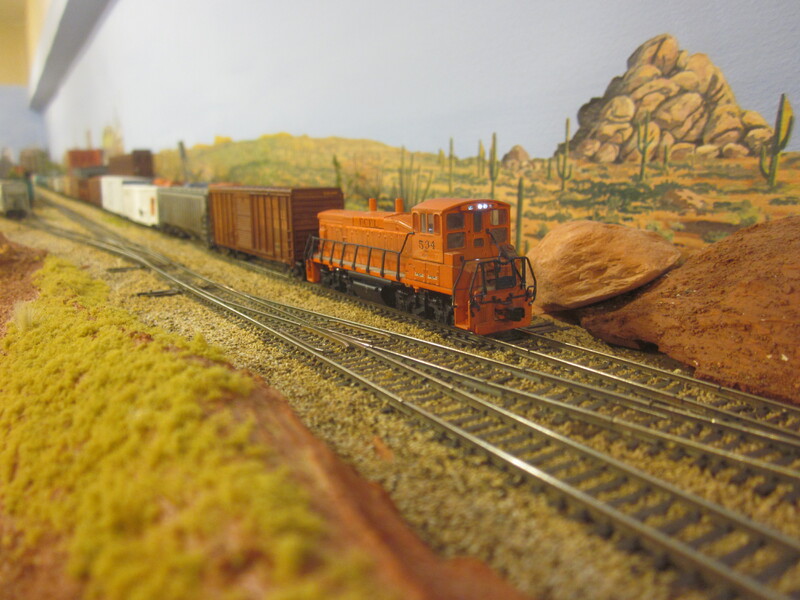 Next week: Action picks up in Salvation Point, where the yard crew gets busy assembling the local trains for Flagstaff, Herbst Junction, Gallup and Globe. 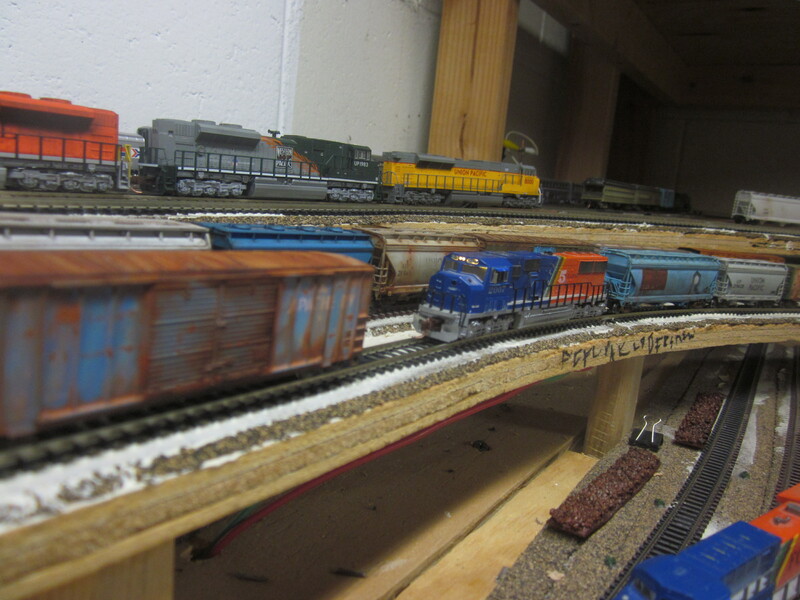 FCFL MP1500DC #534 sorts a string of cars at Salvation Point Yard. 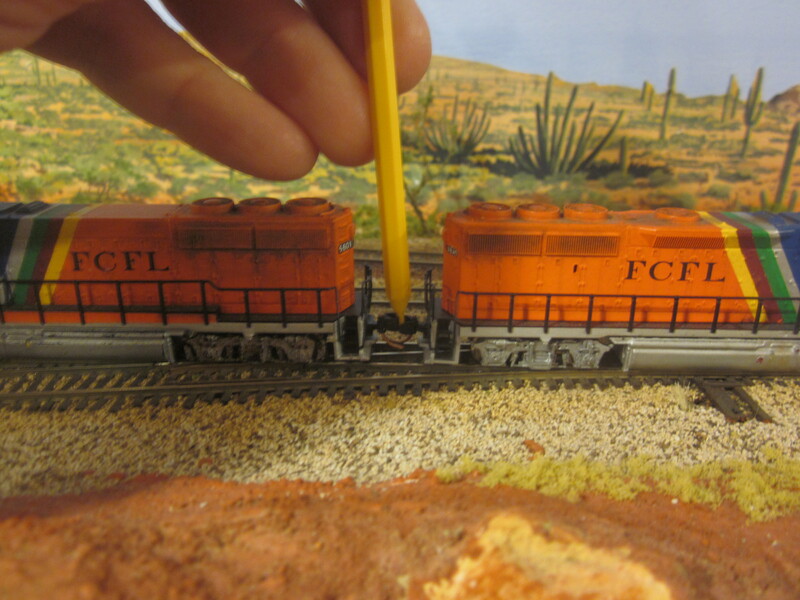 The FCFL uses a “car-card” operating system to route cars across the layout. 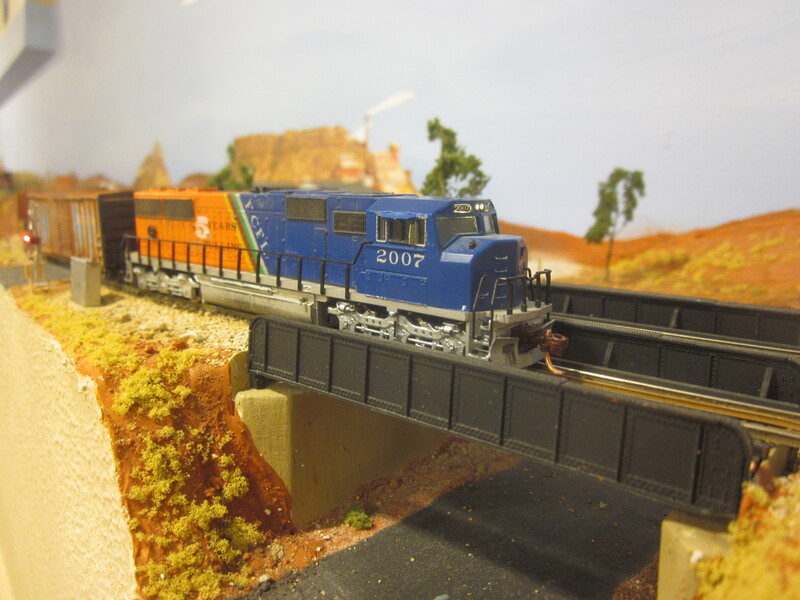 For my 10th birthday or so my Dad gave me an Athearn F7 A and B set in the Santa Fe warbonnet scheme and when my friends came over for my birthday party I proudly showed it off, lap after lap, on our HO layout. No, my friend. We don’t run trains. We operate them. 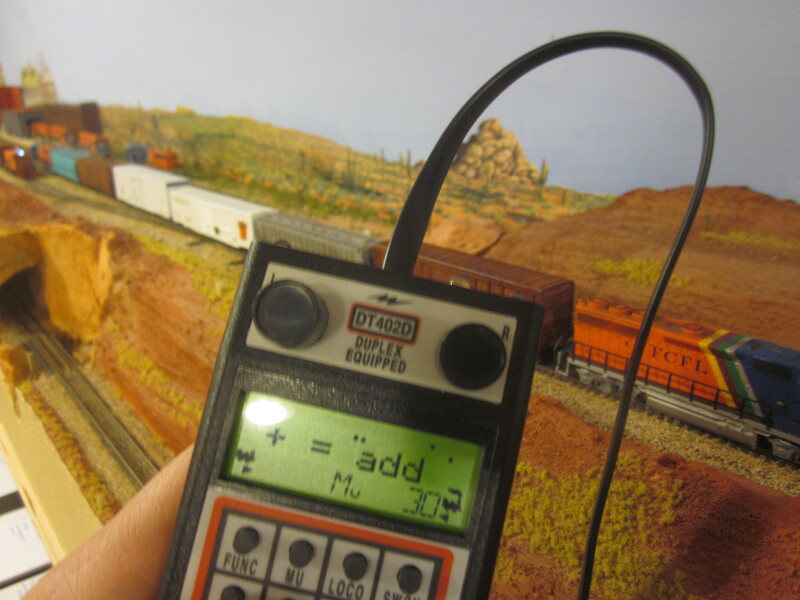 Some guys golf, some guys make their own beer, I use a home-grown car-card system to route model train cars to various destinations on my model railroad layout. 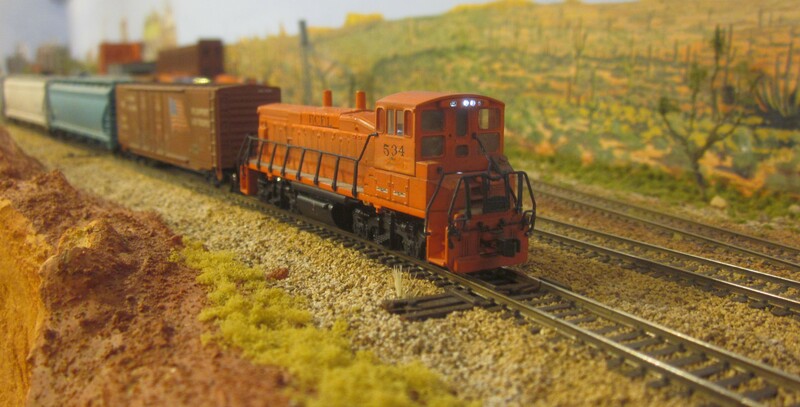 One of the finest examples I’ve seen is the Ford City Northern – the spectacular freelanced layout of a friend from the railroad club. 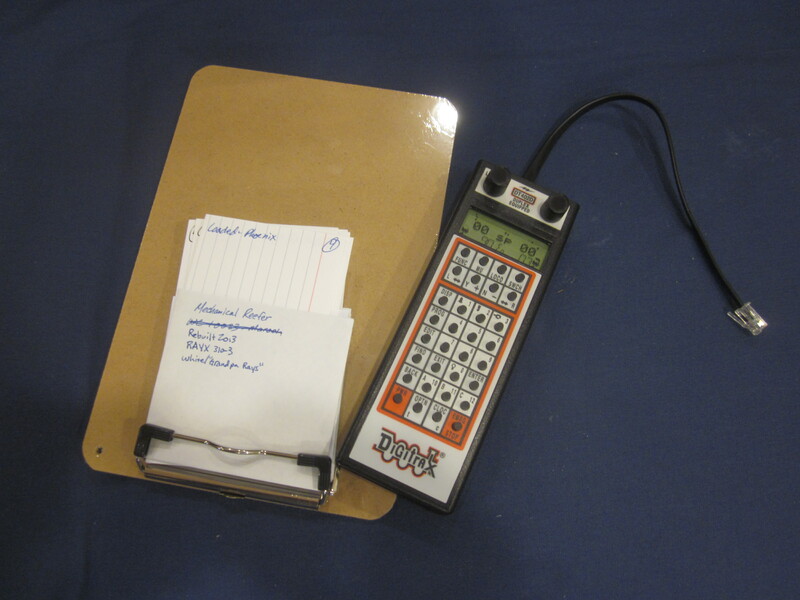 He runs formal operating sessions and has manuals, handbooks and schedules for the trains. My operations are pretty rudimentary by comparison, but I think my system is still pretty fun. Over the next few posts I’ll describe it. 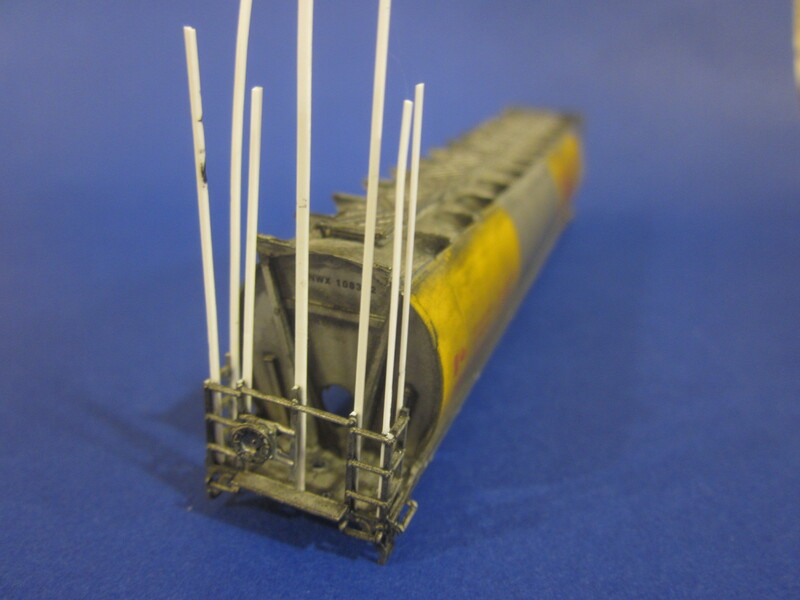 If you’re a model railroader, maybe you’ll get an idea or two for your own layout. 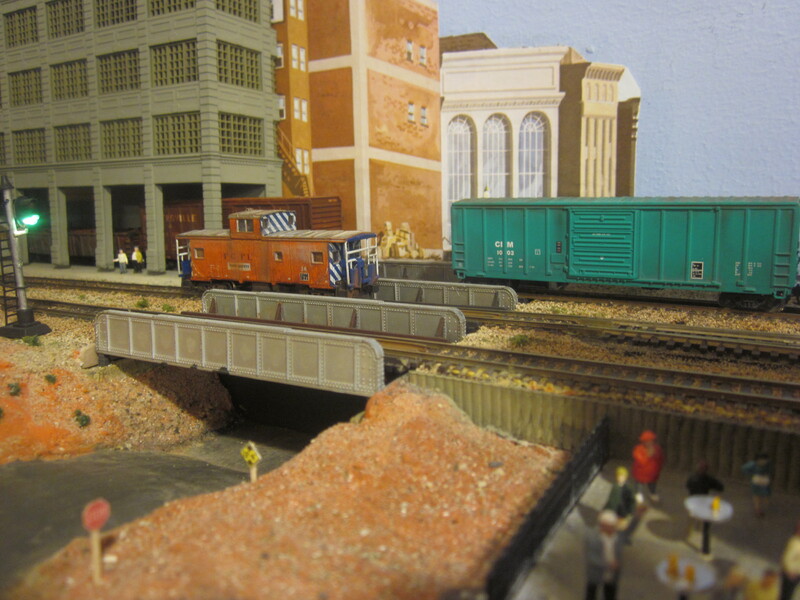 If you’re not a model railroader, it’s not too late. I make the pockets by sealing stationary envelopes and cutting them in half. 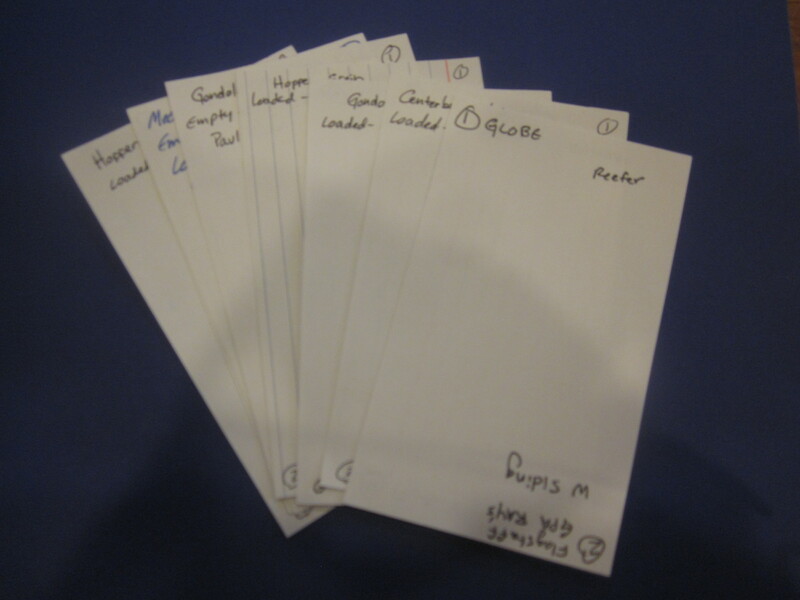 The pockets fit “assignment” cards – 3×5 cards that have four destinations written on them. The destinations are numbered one through four. The car is delivered to destination one, then at the next operating session to destination two, and so forth. 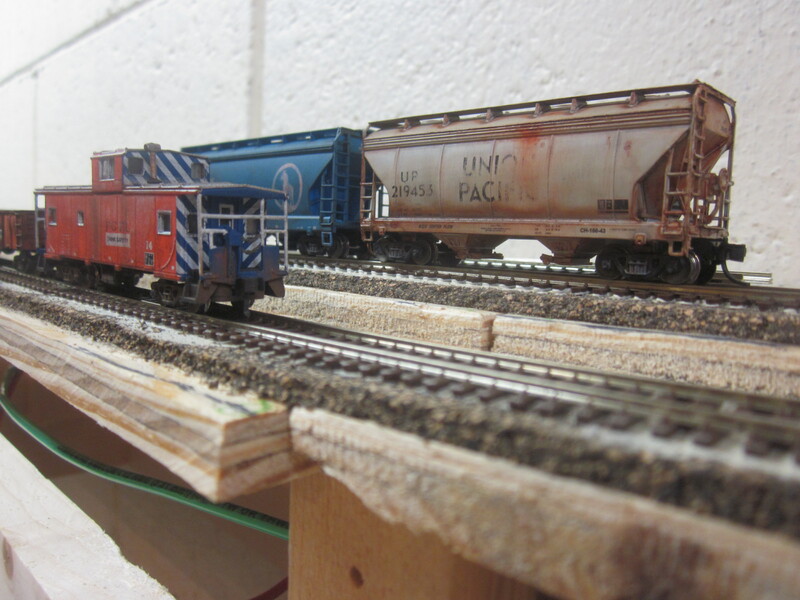 The fourth destination is always one of the staging areas, where the car is taken off the layout and stored until called upon for another cycle. 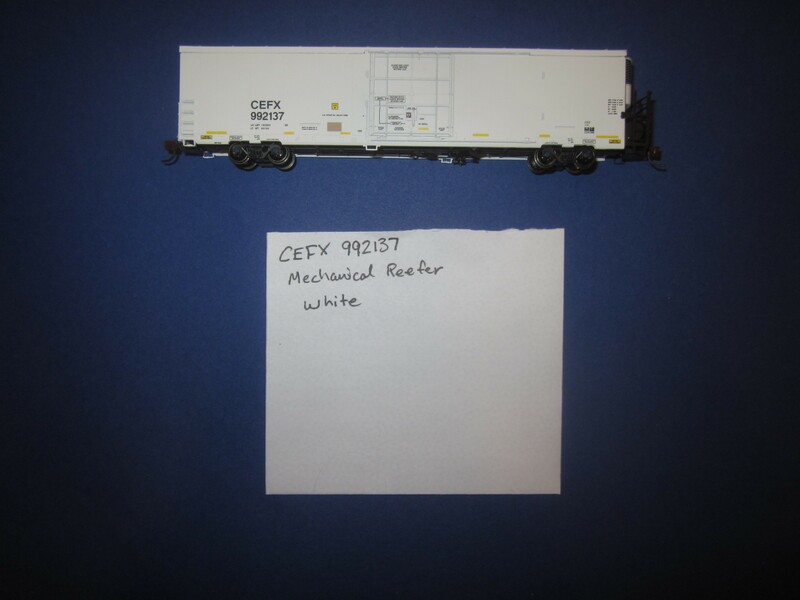 I have made assignment cards for all the different kinds of rolling stock on the layout – boxcars, grain hoppers, plastic pellet hoppers, refrigerated cars, gondolas, etc. Eventually I’d like to start a session by pulling 20 cards for the Durango-Phoenix run and then going to the storage boxes to find the appropriate rolling stock. The fleet isn’t large enough to accommodate that yet. For now, I have to figure out what cars I have available and sift through the assignment cards to find matching loads. Next week: I’ll walk through the setup, and we’ll ride along on the Durango-Salvation Point-Phoenix run.